The first verse describes the Self as sat cit ānanda, while the second verse describes It as self-effulgent. In the third verse, the Self is described as the Self of all. Early in the morning, I bow to the limitless, that which is beyond darkness, which has the luster of the sun, which is the changeless support known as the supreme being, in whose limitless form the entire universe has appeared like a snake upon a rope. Prātarnamāmi, early in the morning, I bow down to you, I salute you. We bow down to one who is worthy of worship and reverence. When I stand erect, I have a long shadow, and when I bow down, my shadow becomes shorter and shorter; when I fall flat, and there is no shadow at all. Bowing down is a symbol of falling flat at the feet of the Lord, the revered one. Falling flat means that I am not there, only the Lord is there. The ultimate limit of salutation is that I, who am saluting, am not there; only you, whom I salute, are there. The ultimate meaning of namaskāra is non-duality. I completely erase my ego and become one with you. It is like a river merging into the ocean. The river bows down to the ocean. That is, the name and form of the river is given up. The river is no more a river. One may think that the river is completely destroyed when it merges with the ocean. Yet, in doing that, the river only gives up its limitation of ‘river-less’. It is now a limitless ocean, boundless. By giving up its boundaries, it becomes boundless. It is not that the river has become the ocean; the river does not have to physically merge into an ocean to realize its true nature. What is a river? It is only water. It becomes a river by identifying with a name and form. An ocean is also water. When the river recognizes that it is water, it is liberated. The river’s merging into the ocean means that it loses its ‘riverness’ and ‘becomes’ the ocean. ; there is only the Self. The duality is completely dropped and that is what is meant by namāmi. Tamasaḥ paramarkavarṇam. Tamas means darkness. Param is beyond. Tamasaḥ param is that which is beyond the darkness. Arkavarnam means of the luster of the sun, the self-shining sun. It is another way of enabling us to see the nature of ourselves. Darkness, here, stands for ignorance. The Self is beyond the darkness of ignorance, meaning that which even illumines ignorance. The Self or Consciousness illumines ignorance. Both ignorance and knowledge are states of the mind. Therefore, we are also aware of our ignorance. For example, you know that you do not know the Chinese language. Your awareness of your own ignorance is also illumined by the Self; then alone can you know it. That which illumines ignorance is beyond ignorance. Ignorance is also mithyā. The Self is like the sun in that it is self-shining, self-illumining, or self-effulgent. It is thus beyond the darkness of ignorance, and even illumines ignorance. Pūrṇaṁ sanātanapadaṁ puruṣottamākhyam. Pūrṇam is that which is limitless; it is filled from all sides like an ocean. Pru is to fill, fill completely. Sanātanapadam. Sanātana means that which is beyond the limits of time; it is all-inclusive, beyond the limitations of space. Puruṣottamākhyam is ‘known as the supreme being’. Puruṣottama is the most exalted person or important being. Lord Krishna says in the Bhagavad Gita [15-16] that there are two kinds of puruṣas: kṣara, changing, or the effect and akṣara, changeless, or the cause. Puruṣottama is beyond cause and effect. These two persons (exist) in the world, the perishable and the imperishable. All beings and elements are called the perishable, the changeless (is called) the imperishable. Now, Śrī Śaìkaräcārya says a very interesting thing in the last line, yasminnidaṁ jagadaśeṣa-maśeṣamūrttau rajjvāṁ bhujaìgama iva pratibhāsitaṁ vai. Yasmin, in whom; idam jagat, this entire universe; aśeṣamūrttau, in the limitless form, rajjvāṁ in a rope; bhujaṅgam, like a snake; pratibhāsitaṁ vai, has appeared indeed. 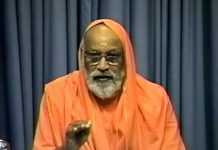 What does Vedanta say about creation? Vedanta accepts the creation to be like the creation of a snake on a rope. A rope is mistaken to be a snake because of the ignorance of the rope. This ignorance gives rise to the delusion that it is a snake, or causes the projection of a snake where there is a rope. So is there a snake or not? If there is no snake, how do you see it? The person who suffers from the delusion of the snake does indeed see a snake. He has palpitations and high blood pressure, and is frightened by the snake. A non-existent snake cannot create all these effects in a person. If there is no snake, it will not be perceived. On the other hand, if there were a snake, it would not disappear when you throw light upon it. A Vedāntin would neither say that the snake is, nor that the snake is not. It is anirvacaniyam, indescribable. There are only two categories: is and is not; there cannot be a third category. The snake does not fall into any category. This is the nature of the creation. Just as a snake is created out of a rope, so also is the universe created from brahman. It is mithyā, unreal. Can you tell me where the snake is? Is it in the mind? If it were in my mind, the snake should be wherever my mind is. But it is not so. If the snake is not in my mind, is it in the rope? If the snake were in the rope, the snake should be wherever the rope is. Even upon shining light on the rope, the snake should be there; but, it is not. Thus, the snake cannot be said to be either in the rope or my mind. It is anirvacaniyam. Bhuja means arm; a snake moves on it arms, not on its feet, and that is why it is called bhuja. Just as a snake appears on the rope, so also, the whole universe appears in brahman, the Self. What is this universe? It is all the names and forms. For example, what is a clock? A clock has a name, nāma, and a corresponding form, rūpa; it is, asti; it shines, bhāti, and it is useful, priyam, dear. Thus, a clock has all five aspects in it: asti, bhāti, priyam, nāma, and rūpa. I speak of a clock because I am aware of it. It shines in my awareness, and it is dear to me because it is useful to me. Every object in the world has asti, bhāti, priyam, nāma, and rūpa. What separates one object from another is the name and form. Asti, bhāti and priyam is the most common denomination. For example, both a bangle and an earring have the common denominator of gold. We can say that gold appears as various ornaments: a bangle, an earring, a chain etc. Similarly, asti, bhāti and priyam, which is the real content, appears as the different names and forms. An ornament is gold plus a name and form. Similarly, an object is asti, bhāti and priyam plus a name and form. Just as gold appears as various ornaments, so also, asti, bhāti and priyam, sat cit ānanda, the Self, or brahman appears as this whole universe of names and forms. Just as a rope shines as a snake, so also, brahman, asti, bhāti and priyam, or sat cit ānanda appears or shines as the entire universe of names and forms. Yasmin, in whom, aśeṣam jagat, this entire universe, has appeared. The entire universe can be reduced to names and forms. This universe of names and forms is nothing but the manifestation of asti bhāti priyam or sat cit ānanda. In the ḹśvāsyopaniṣad, the first vākya is īśā vāsyamidaṁ sarvaṁ yatkiñca jagatyāṁ jagat, whatever is moving or changing, every name and form should be known as īśvara. This is the Lord, brahman, asti, bhāti and priyam, or sat cit ānanda. That is all that counts! What counts in an ornament? It is the gold. An earring, bangle, chain, or any ornament is but gold. All we need to do is change the focus of attention from the name and form to the gold. Similarly, all we have to do in this world is to change our focus from the name and form to the fact of asti, bhāti and priyam. Asti bhāti priyam is not out there; it is one’s own Self. The whole universe of names and forms is superimposed upon the ‘I’. It is the ‘I’, the Self, sat cit ānanda, which shines in the varied multitude of names and forms in this universe. I bow down early in the morning to that Lord who is pūrṇam, Whole and Complete, sanātanapadam, the eternal abode, and puruṣottamākhyam, known as puruṣottama in the scriptures. Prātassmarāmi, I remember, prātarbhajāmi, I worship, and prātarnamāmi, I bow down, I salute. This is a stotra or hymn consisting of three verses to be meditated upon at dawn. These verses are an excellent means of meditation if one can remember them along with their meaning. They are useful for meditating upon the truth of one’s own Self and to remind ourselves of who we truly are. It is a good idea to set aside sometime everyday, to step out of all our roles and duties. All our costumes are given up during this period of meditation. An actor can perform his role properly only when he is aware of his true nature. Even when he is acting as a beggar, there is an awareness of who he truly is in his mind. He doesn’t get lost in his role; if he were to get lost in his role, he would not be able to act properly. That is the real skill of an actor. Only when he remembers his true identity in his own mind, can he create a distance between himself and his role. Only then can he perform his role effectively. Therefore, we reflect upon these verses in the morning and remind ourselves of our essential nature. We get into a rut; we get sucked into this vyavahāra of likes and dislikes, and soon, we are entangled in them. 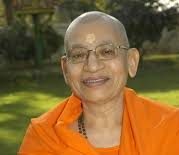 However, we need to be clear of this vyavahāra even while remaining in it. Like the actor who really does not beg even while begging, we should be able to perform our duties without really getting affected by them. What happens when the distance between the actor and the role is not maintained is that the problems of the roles become the problems of the actor. Therefore, it is necessary to create a distance between the actor and the role. These verses help us create a distance between ourselves as actors, and the roles that we are required to play. When I create the distance, I accept all the various roles, whether of a daughter, or mother, wife, mother-in-law, or grandmother. I see that I am separate from all of these roles, free from all their attributes, and untouched by them. Just as an actor remains untouched by all the problems pertaining to the roles he plays, so also can I remain untouched by the problems of my roles, if I create that distance. This is the creation of a distance in understanding, not a physical distance. It is not a distance where I see myself standing in a corner, apart from myself. 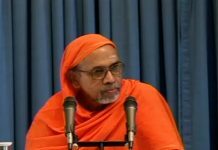 This distance lies in distinguishing between the person and the personality; it lies in knowing that the person is working through the personality or the body-mind complex, which is the costume given to me to perform various functions. If this distinction between the person and the personality, the actor and the role, or the Self and the non-Self is known and maintained, life becomes a play. If we do not maintain the distance, it becomes saṁsāra. The only difference between a liberated soul and a saṁsārī is that one maintains the distance while the other doesn’t. Instead, he lumps the Self or the person and the non-Self or the personality together. Where there are two, there is a delusion of there being only one. That is why all the problems and limitations of the personality become the problems and limitations of the person. This stotra helps you create a distance. The verses help you in a time of crisis. When you are crying, you can examine who is crying; when you are hurt, you can ask who is hurt, and when you are insulted, ask who is insulted. It is the body and the mind that is insulted. It is alright; you are none of that. You should create a distance because it is true that you are not that. solution to all our sorrow. Solving all the vyavahārik problems is a different matter; it is not the concern of the Vedāntin. There is nothing to be sad about. When we create the distance, we have better composure of mind, and can solve our problems more easily. The last verse says that even the two categories of the Self and the non-Self do not really exist. What you call as the non-Self, the creation, is nothing but the Self shining as this universe. In the ultimate analysis, there are not two categories. Even though we are asked to create a distance between the Self and the non-Self, it is better to recognize that there is only the Self, only one, only brahman, the Limitless. What does it matter what one wave does to the other wave because you are not the wave at all; you are the water. 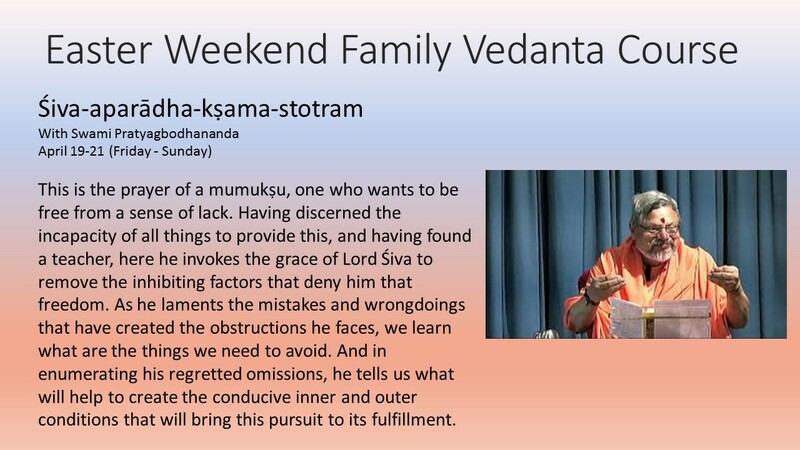 the most profound teaching of Vedanta.